Today is the 4-week-aversary of getting diagnosed with ADHD, and I’m in a mood to celebrate. Unfortunately my son is home sick from school, so I’m stuck under him on the couch while he dozes or whimpers. I suspected years ago that I might have ADHD but I didn’t want to add yet another label to the list of things that were “wrong” with me – the list already includes T1 diabetes, asthma, and depression. Then last year I had a breakdown and part of the process of healing included rejecting and reframing negative beliefs about myself (still very much a work-in-progress). 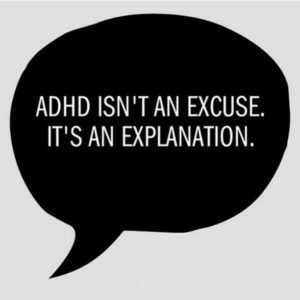 Seeking an ADHD diagnosis was no longer about another negative label to deal with, it was about finding a reason for things I’ve struggled with my whole life. It doesn’t change who I am as a person but it does explain some things that I had been critically told were deep character flaws, and I should just try harder. It’s hard to constantly receive that message when you’re already trying hard just to do the bare minimum; things that seem easy for others. Having a psychiatrist confirm that in some ways my brain doesn’t work like others suddenly lifted a weight off. I’m not a bad [disorganised, late, distracted, impulsive, intense, forgetful] person. I have a neurological disorder. And there is help available. I don’t blame anyone for not picking it up when I was a child. I have inattentive type rather than hyperactive type, which means I wasn’t disruptive. And there wasn’t as much information available 20+ years ago. I was smart enough to get by. But having the label now helps me to start shedding some of the shame and frustration that undiagnosed ADHD has caused in my life. I feel less guilty about my debt, unfinished projects, and damaged relationships, and I have a better understanding of strategies that can help me manage things going forward. I also have medication. I acknowledge that meds work differently for everyone and respect the choice not to take them, but for me they have been life changing. I was sure I needed medicinal help to do life, but the antidepressants I was prescribed last year weren’t right. They turned me into a zombie – I slept all the time and lost my creativity and interest in the world. I thought they helped to start with but they didn’t. Depression and anxiety are common in adults with undiagnosed/untreated ADHD. In contrast, the methylphenidate (rubifen/ritalin) makes everything more manageable. It improves my mood, helps me focus, and makes me feel calm and in control. For someone who has felt out of control my whole life, this is A Big Deal. I feel more grounded and less like a fizzing ball of thoughts and emotions. I am more hopeful about the future, and cutting myself some slack about the past. I’m less inclined to shut down and avoid things, and feel more confident in tackling them. And if you suspect maybe something isn’t quite right with you or your child, I encourage you to talk to a professional. Without a diagnosis struggles can become dangerously internalised. Labels don’t necessarily mean a lifetime of stigma or hardship, instead they can mean understanding, support, and access to resources. Good on you for writing about this! I got my diagnosis over half a year ago in my late 20s and it is a very unique and amazing journey that is certainly worth celebrating at 4 weeks. class="post-template-default single single-post postid-562 single-format-standard samba_theme samba_left_nav samba_left_align samba_responsive"